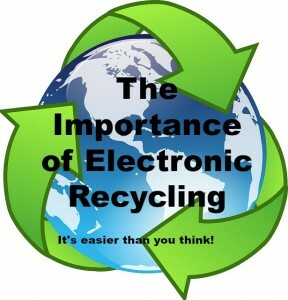 What is Electronic Recycling & How Can You Get Started? That alone is reason enough for us to be in complete support of these recycling initiatives. We included a post back in May 2014 in regards to Spring Cleaning Tips to Save Money and the Environment. We received a ton of great feedback regarding this post, so we wanted to build upon this and provide you with some useful information about Electronic Recycling In and Around Baltimore, MD; Washington D.C, & New Haven, CT. Currently there are even programs and initiatives for you to sell your old items and make some money. There are still the old standby options, such as eBay. Here you can take photos of your device and list it online to let others make bids to purchase your item. You can also set a “Buy It Now” option to ensure you make the amount you would like. It does cost some money to list these items, so be sure your “Buy It Now” price isn’t too high. Cellular phone providers will also recycle your items for you and give you some money for it without the hassle of creating an eBay listing. For example, here is some information regarding the Verizon Wireless recycling program. There are also companies that have created technology trade ins in the store, Staples Technology Trade In, will allow you to bring your item into the store and have it inspected, and give you a quote on what it is worth, while you wait. The catch here is that it is for store credit, just a heads up. If your device has no trade-in value, Staples will still recycle it responsibly for you. You can also check out your nearest Best Buy for trade in programs or free electronic recycling services. We think that is pretty awesome! What Electronic Items Can I Recycle? It only takes a moment, but instead of us just throwing these items in the garbage, if we dispose of these things responsibly the world will be a better place. I think that is something we can all get behind. Thank you for doing your part and please help us to spread the word.